Brunner stages a colorful open house in its first major campaign for Mitsubishi Electric Cooling & Heating. To dramatically convey the idea that Mitsubishi systems allow different temperature settings for various zones of a home, the agency built a life-size mock-up house, facilitating a seamless commercial shoot with no CGI required. The dwelling consists of two huge 22-by-35-foot open-faced sections, each containing five fully furnished rooms across their respective upstairs and downstairs levels. 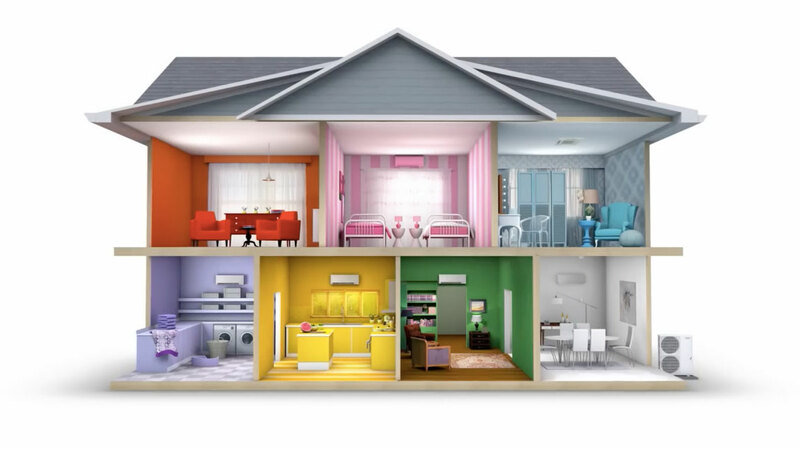 The rooms are color coded to represent different "Shades of Comfort"—e.g., the heating and cooling preferences of different family members. For example, Grandma likes it warm—76 degrees—so her room is rendered in deep coral tones, while Dad's mancave elsewhere in the house is set to 68 degrees and decorated in cerulean hues. In effect, each resident gets his or her own customized house warming. Or cooling. You get the idea. "When you see this large, quirky family full of different personalities sharing a home and living together comfortably, you see how this could work for your family," Brunner senior writer Ashley Cagle Conrad tells AdFreak. "Hopefully, you'll find a bit of truth in each character's comfort story as well." Yeah, the gags are lukewarm, but the work is visually appealing and delivers the brand message to a high degree. It took about three weeks to construct the house (in an otherwise empty warehouse). And while the elaborate set was very much like the real thing, there were some drawbacks. "It didn't have stairs," Conrad says. "The cast had to be placed in the upstairs rooms via cherry picker. At one point, we broke for lunch and turned the lights off and everything. As we're eating, we can hear this tiny voice. It was Grandma! The crew had forgotten to get her when we broke for lunch, and she was stuck in the orange room!" Bet that got her all hot under the collar.